You live in a world of awesome progress, but paradoxically, of appalling evils. WHY? 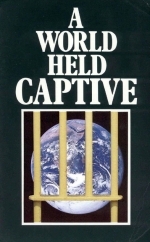 It's a world held captive, deceived into loving its captivity. Deliverance from kidnap in deception, human discontent, suffering and death hastens nearer. World peace, happiness and joy are just around the corner. But most astonishing of all is the actual fact of the colossal kidnapping of all time-in which the captive for 6,000 years has willed to pursue the life and evil philosophy of the archkidnapper — Satan the devil. The willing victim in this case is the world that inhabits this planet earth! Yet this world has been so completely deceived that it cannot realize what actually has happened to it. In this 20th century a world of awesome progress and material development is so blinded by the deceptions of the super kidnapper that it cannot understand the paradoxical fact that its progress is accompanied with appalling and still escalating evils, which are inflicting indescribable suffering, frustration and death. I have learned, in a lifetime now in its 92nd year, that errors all too frequently arise from a false premise, carelessly assumed. The eyeglasses through which all modern thought is viewed is this theory of evolution. To my satisfaction, after in- depth study and research, the theory has been proven false. If you prefer to believe this illusion because it is presently the educational "IN" thing, you can have no rational understanding or explanation of the conditions of the world in which you live. The Word and God LIVED. What did they do? They created. How did they live — what was their "life style"? They lived the way of their perfect character — the way of outflowing LOVE. When Christ was baptized, God the Father said, "You are my beLOVED Son." God LOVED the Word. And the Word LOVED God — obeyed him completely. When the only conscious life-Beings existed, God was leader- -in authoritative command. Thus, even when the only conscious life-Beings were God and the Word, there was GOVERNMENT, with God in supreme command. Since they created other conscious thinking life-beings, this very fact of necessity put the GOVERNMENT of God over all creation, with God supreme ruler. Bear in mind the government of God is based on the LAW of God, which is the way of life of outflowing LOVE, cooperation, concern for the good of the governed. And this law of God produces peace, happiness, cooperation through obedience. Job 38 says plainly the earth was created when angels had been previously created. God placed a throne of GOVERNMENT on the earth. Both Isaiah 14 and Ezekiel 28 reveal the cherub Lucifer being placed on the throne of the earth. II Peter 2:4 reveals that angels SINNED. Lucifer was a super archangel. Lucifer had been trained in the administration of God's government on the very throne of God in heaven. He was supremely beautiful, dazzling in brightness. Vanity seized him. Vanity is self-glory, self-centeredness, concern for self even to the point of hostility toward others. He became jealous, envious, resentful and hostile against God his Creator. He turned hostile to the law of God. He turned to a way of life of vanity, covetousness, envy, rivalry, competition, violence and destruction. And this hostile way of life is itself a LAW. It is the law of vanity, self- concern, "do your own thing," rebel against the authority of God. That, then, became the basic LAW of the GOVERNMENT of Lucifer, whose name was changed to Satan the devil. The name Satan means "adversary." Under Satan, darkness replaced light. Later the Word spoke, "Let there be light," and physical light appeared on earth, dividing day from the darkness of night. In six 24-hour days God renewed the face of the earth for men, creating plant, fowl, fish and mammalian life. On the sixth day, God said: "Let us [God is speaking to the Word] make man in our image, after our likeness" (Gen. 1:26). The Eternal (who became Jesus Christ some 4,000 years later) formed man of the dust of the ground (Gen. 2:7), and upon breath of life entering, man became a living (not immortal) soul. Man could not be made into the spiritual and character image of God without the power of MIND — thinking, reasoning, decision- making intelligence. The modern science of brain research has demonstrated that the small differences in human brain and animal brain cannot explain the vastly superior functions and output of the human brain. The human brain can acquire knowledge of chemistry, geology, astronomy, physics — one might say all the vast intricacies of knowledge contained in a many-volumed encyclopedia. Man can thence can put many parts of such knowledge together in a thinking and reasoning process. Man has decision- making ability. The first law of science is the fact that only life can beget life. Life cannot come from the not-living. LIFE could not have gradually come into existence from nothing. God could not have gradually come into existence. God and the Word ALWAYS have coexisted — without father, without mother, having neither beginning of days nor end of life-but living from eternity through eternity. God placed Adam and Eve after creation in the beautiful garden of Eden. In its midst were two special symbolic trees of tremendous significance. Adam did not have immortal God life, but God freely offered it to him through the tree of LIFE. Adam had to choose between the government of Satan with its self-centered way of life, and the government of GOD with its GOD-centered way of life. Each way of life was the basic LAW of a GOVERNMENT. God could have RESTORED the government of God on earth through Adam, had he chosen that WAY of ETERNAL LIFE. On creation, late on the sixth day we call Friday, God briefed Adam and Eve on the situation. He continued through the Sabbath eve and on that first Sabbath. He explained that if they adopted the way of SELF-centeredness, symbolized by the tree of "the knowledge of good and evil," they would reject God's gift of LIFE (immortal), and on taking the forbidden fruit they would surely DIE. Notice, however (Gen. 3), Satan did not say to Eve, "Choose MY government and my law of vanity and self-centeredness, and reject God." He merely tempted her with the city of the forbidden tree, appealed to her intellectual vanity, suggested God wasn't fair, and let her succumb to his deception, assuring her she was already an IMMORTAL SOUL. She was deceived into believing Satan, disbelieving God and into TAKING of the forbidden fruit. She gave also to her husband, and Adam willingly disobeyed God. Adam took TO HIMSELF the knowledge — that is, the production of knowledge — of what is good and what is evil. Willingly, Adam was led into captivity by Satan. He had willingly gone along with Satan, the arch kidnapper of all time. There cannot be a law without a penalty. The penalty of human sin is DEATH. At this very foundation of the world, it was determined that Jesus Christ, as the "Lamb of God," should be slain in payment of the penalty for all human sin (Rev. 13:8), effective upon repentance and faith. It was also determined by God at that time that all Adam's children should die (Heb. 9:27), but as in Adam all must die, so in Christ the same ALL shall be made alive by a resurrection from the dead to be judged (I Cor. 15:22). But still, none could ever be born of God until God's holy and perfect spiritual character had been instilled within, by individual choice and proof by performance. The angry crescendo of world violence heats up furiously, as the arch kidnapper, in a rage, perceives the fast-approaching END of the captivity. You need to UNDERSTAND what is prophesied soon to happen — and why! You were born into the panorama of world events that started 6,000 years ago. A divine PURPOSE is being worked out here below. The catastrophic arch kidnapping of 6,000 years ago shall not prevent the working out of that supreme PURPOSE. An optimist turns the lemons thrown at him into lemonade. The supreme GOD is turning the evil of this kidnapping into the supreme GLORY of ALL eternity! In all this world's learning and recorded knowledge the one most basic and all-important dimension has been missing. That great super colossal, yet unknown TRUTH, is the one supreme PURPOSE of the great Creator God, and his master plan for working out that overall PURPOSE. This is REVEALED knowledge, and its revelation is contained in the world's most widely distributed, best-selling book. Yet that book is the most totally misunderstood, most distorted, falsely interpreted, misrepresented of books. That book is an enigma. It is a coded book and the one instrument of decoding into plain and simple UNDERSTANDING is the very tree of life, which the father of all humanity — Adam — rejected; and which is today opened ONLY to those called and drawn by God to come to him through Jesus Christ — those called to be the one true original Church of God. Without the indwelling of God's Holy Spirit none can understand that book. In this episode, revealed in Genesis 3, man and his human family, potentially God's children, were kidnapped — became the property of Satan. They chose Satan's WAY — self-centeredness — instead of God's will. They chose the law of Satan instead of the spiritual law of God. Sin is the transgression of GOD'S law. Adam could have qualified to RESTORE the GOVERNMENT OF GOD on earth. Instead, he and his human family — this world — have to this very day been HELD CAPTIVE by Satan, who sits still on earth's throne. Out of Adam and Eve developed human civilization. Had Adam chosen the tree of LIFE, he would have been brought into direct relationship with God — begotten as God's own son. Through God's Spirit joined with his human spirit, he would have had the ability to understand God's spiritual purposes and knowledge, and be able to develop the very mind of God. He would have been led by God in building GOD'S WORLD. Instead, he was led by Satan, and the whole world family, started through Adam, was DECEIVED into building a civilization that became SATAN'S WORLD — a WORLD HELD CAPTIVE. That is the reason God then, at the very time of Adam's disobedience and kidnapping, decreed that Jesus, the second Adam, should come. He would be God's means of paying for the ransom to reclaim his potential children. Further, Jesus would be the SECOND ADAM. To use a modern slang term, it would be "a whole new ball game." The very begotten FAMILY OF GOD, for which Adam had been created, would now be started in and through the SECOND ADAM. Jesus, unlike the first Adam, did choose the tree of LIFE. He did obey God. He met, conquered and qualified to replace Satan on the throne of the earth. At the same time, God decreed that as in Adam all would pay the penalty of DEATH, so in Christ, the second Adam, the SAME ALL would in God's due time be resurrected again to physical life, brought to judgment, sentenced to eternal death, but then learn that their death penalty had been paid for them by Jesus Christ and the tree of LIFE then reopened to them in the Great White Throne Resurrection (Rev. 20:11-12). Jesus' coming BEGAN the SPIRITUAL PHASE of God s creation of humans. Jesus did not come to reform or save this world — Satan s world. He came to start a DIFFERENT WORLD. It was God's plan to start it through his CHURCH. Jesus brought the gospel message from God to mankind — not to convert and change Satan's world, but to ANNOUNCE the coming world-ruling GOD kingdom as a witness. Jesus came not on a "soul- saving crusade," nor did he plead with people to "accept him as Savior." When the woman at Jacob's well asked him for the "living waters" of the Holy Spirit (salvation), he merely told her of her sins. Since God's PURPOSE is to reproduce himself — expand the God FAMILY — and since it shall be the world-ruling family, then the KINGDOM OF GOD will be the born family of God ruling the entire world. NO RELIGION ON EARTH UNDERSTANDS THIS PIVOTAL TRUTH! It is a DECEIVED world — held captive by Satan. The Church of God was the embryonic beginning of the soon- to-be world-ruling and world-filling KINGDOM OF GOD. After his 3 1/2 -year ministry, Jesus gave himself as a ransom to be crucified, paying the penalty for all the sins of all mankind who would repent, believe, grow in grace and God's knowledge, overcome and endure to the end of each one's human life. Jesus commissioned his apostles to teach others, as many as God should call. The New Testament throughout teaches that ONLY those God chooses and spiritually calls, could come to him through Jesus. Jesus said: "No man can come to me, except the Father which heath sent me draw him" (John 6:44). Those so called and chosen by God for his kingdom were called "out from among them, [to] be ... separate" (II Cor. 6:17). Jesus did not live as part of this world, its ways and customs — nor must those called. This present evil world of Satan — the kidnapped world — had its foundation in the first Adam. It was at the FOUNDATION of this world that God decreed that Jesus, as the Lamb of God, would come to pay the ransom price (Rev. 13:8). Jesus did not come to repair or remodel or make over this building — this world — this civilization. Its foundation is faulty — that of Satan. Its superstructure — its systems of government and legal systems of law and justice, its systems of faulty and materialistic education, its religions, its social systems and customs — all its superstructures faulty, producing discontent, unhappiness, contention, competition and strife leading to violence and destruction, anguish, suffering, poverty and death. Those are the supporting columns and beams of the superstructure of the building that is this world. Jesus did not come to reform this world — to bring it a "spiritual revival" — to pray for it or to save it or any of its ways. Those converted and finally saved in the Church then shall be kings and priests and given power to rule and teach all others (Rev. 2:26-27; 3:21; 5:10). For this nearly 2,000 years of training, Jesus has been High Priest and head of the Church, in heaven supervising his Church. God started his supreme mission and PURPOSE of reproducing himself through the first human, Adam. But to become a begotten child of God, so that he might, on acquiring the spiritual character of God, be BORN into the divine FAMILY OF GOD, Adam was required to make a choice. He chose apostasy, rebellion, self- righteousness mixed with evil — the way of the kidnapper of the potential family of God. The tree of LIFE was closed to all humanity until Christ the SECOND ADAM. He was born of his mother, the virgin Mary, of the Adamic human family. But her son Jesus was fathered, not by MAN, a son of Adam, but by GOD. As a son of GOD, the tree of LIFE was opened to him. But as a son of MAN, he, like the first Adam, was required to make a CHOICE! Satan tried to destroy him as an infant, but God moved to prevent that. Then, at about age 30, before he could preach a word of God's message, the gospel, Satan attacked him head-on. In this temptation (Matt. 4:1-11), Jesus made his choice. He rejected Satan's temptation and way of life. He chose God's way, according to the Scriptures. He defeated Satan, commanding him to depart from him, and the defeated Satan slunk away. JESUS HAD QUALIFIED TO REPLACE SATAN ON THE THRONE OF THE EARTH! Thus, as Jesus said in Mark 1:15, the time was fulfilled and the kingdom of God was at hand. The SECOND ADAM had passed the test. He had overthrown Satan. He had qualified to replace Satan on earth's throne and to RESTORE THE KINGDOM OF GOD. Sin and rebellion had started with the one man, Adam. Righteousness and obedience leading to PEACE now started with the one man, Jesus Christ. He was the BEGINNING- -THE FOUNDATION — of the altogether NEW "building" — the new world- -the new civilization — the WORLD Tomorrow! Jesus said he would build his Church. His Church was that new building — that new civilization — that new world, in embryo. He also said the Church would never die. The rains would fall (Matt. 7:24-27), the floods would come, the hurricanes would blow, but this NEW house built on the solid rock foundation would ALWAYS stained! Jesus did not say "churches." Paul said they would all "speak the same thing" — no divisions. Where is that Church today? Read our free booklet Where Is The True Church? for the enlightening answer.